Medieval Calicut was known as a prosperous entrepot, often described as the Emporium of the World. People of several nationalities speaking a variety of languages used to visit this busy trading centre and enjoy the peaceful trading ambiance which the rulers had provided them. But, a centre for scholarship - that too, Sanskrit? Not many would readily agree. Even those who are familiar with the Revati Pattathanam at Tali Temple would recall Uddhanda Shastri and how he was snubbed by the diminutive Kakkasseri Bhattathiri in the famous exchange - aakaro hrusva. Naughtier persons would recall the obscene sloka attributed to Uddhanda (Bhaginee.....bhagyabhavo vibhava). But, the range of contribution and the role of the ruling Zamorins (more particularly two of them) is vaster, as was explained to CHF audience the other day by the renowned Sanskrit scholar and Professor and Head of the Sanskrit Department of Calicut University, Dr. C. Rajendran. The story behind Revati Pattathanam as an annual assembly of scholars in the four areas of knowledge – Tarka, Vyakarana, Mimamsa and Vedanta – is well-known and is being re-created even now every year to commemorate the great event. But the wealth of output by these scholars – many of them like Uddhanda Shastri came with the limited aim of a literary conquest but decided to stay on as court scholars of the Zamorins – has not received sufficient notice from scholars and historians of this golden age of Calicut. Zamorins of Calicut were known in history for their skilful governance and their ability to weld together different communities and nationalities in pursuit of the common interest of trade and commerce. Among them at least two were also known as patrons of learning. The annual assembly of scholars in Tali temple may have started in the 13th Century, but it was with Manavikrama the Great (1466-1471) that royal patronage managed to attract the talents from far and wide. Undoubtedly, the star among them was Uddhanda Shastri who set off from Natapuram in Chengalpattu (Tamil Nadu), was disappointed with the cold reception that he got from the Karnataka ruler and stormed into Calicut, announcing his arrival by a sloka in which he warned the poetic elephants of Calicut that he, the literary lion was in town and they better take cover. But, according to Dr. Rajendran, Uddhanda’s real contribution is not in the histrionics at the Pattathanam but the valuable glimpses of Calicut history that is revealed in his poems, particularly in his Kokilasandesam . He describes the vibrant urban life of Calicut where every house was white-washed and shining and where young men and women frolicked in the streets. Lakshmi, the goddess of wealth lived in Calicut and the proof of this could be seen in the ships laden with riches from around the world, anchored in Calicut harbor which the poet describes as the dowry sent to Zamorin by his father-in-law, the Ocean whose daughter Lakshmi was! The reference could have been to the Treasure Ships of the Ming Chinese which had frequented Calicut for well over three decades in the first half of the 15th Century. His description of Onam – when the young girls would sing to the accompaniment of villu, and young men would be found running around worrying about how to manage to buy the traditional Onappudava for their women – has a contemporary tone. So is his description of Conjee (of Chinese origin?) with coconut scrapings, green gram curry and ginger chutney! Uddhanda had also written a short drama called Mallikamarutha which he had staged at the Tali temple. The Zamorin Raja himself was no less a scholar and had produced a commentary on Murari’s Anargharaghavam called Vikramiya. Another great scholar who adorned the Zamorin’s assembly was Chennas Narayanan Namboodiri who transformed temple worship in Kerala with his treatise called Tantrasamuchaya. The other great patron of learning in Calicut was the Zamorin named Manaveda (1658-1662) who is more popularly known as Manaveda Kavi for his Krishna Geethi on which the dance drama of Krishnanattam is based. According to some western writers, Krishnanattam can be said to be the first opera in Sanskrit. One of his courtiers, Narayana Pandita wrote the second part of Manameyodaya, a philosophical work. 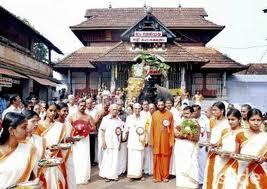 There were many Sanskrit writers in and around Calicut those days like Anantanarayana and Sambashiva. We have little information about their contribution, other than stray references to their writings by contemporaries. Dr. Rajendran concluded his talk with a reference to the only woman scholar in the male-dominated galaxy, Manorama Thampuratti who was so learned in the annotation of Siddhantakaumudi (called Manorama) that she started being called after this annotation. Her lament at the plight of having been forced to be the life partner of an illiterate Namboodiri is matched only by her romantic epistles addressed to Prince Karthika Tirunal, the Dharma Raja of Travancore ! Thanks for the detailed commentary. I would like you to give credit to people in Calicut who revived this in 1950s & 60s. I attended the presentation of Dr. Rajendran. It was scholarly and touched several aspects of the social life of Calicut. Thanks for inviting him. Oops I forgot to jot in my comment. Well, one person is notably missing, the Vidwan Ettan thamburan Zamorin 1912-16. I will write about him another day.. I have enriched myself. Thanks. Uddanda Shastri was indeed a great scholar and his Kokila Sandesha is a beautiful description of the parts of Kerala he knew and loved so well, including Calicut. Thank you, Venetia. Great to know that Rasala Books have brought out an annotated edition of Kokilasandesha. I am sure our readers will be interested in obtaining copies. Insisting teenagers to start investing as early as possible is a must if they want to have a stabilized financial status in the future.With this article, it can persuade them and let them know the basic things to start.